In the mid-1970s engineering whiz-kid Steve Wozniack designed a computer that he, personally, would love to own. With friend Steve Jobs he eventually built a few naked-board units based on this design in a garage. The Apple I was born! These proved so successful that they started production of an improved model in a stylish molded plastic case. The newly-clothed machine was given the logical name of Apple II. Released in 1977, the Apple II had a full-stroke keyboard, colour, graphics and sound. It was easily expanded up to (what was then a massive) 48k of RAM. Although TV and cassette capable, most were sold with a screen and (from 1978) disk drives, the disk controller having also being designed by Wozniack. As he also loved computer games along with computers, the Apple II even had a joystick port! The hardware was an open book, easy to tinker with and repair. Eight card slots meant that third-party hardware could be built to extend the machine way beyond the basic unit. As well as a machine for the hobbyist and game-player, the Apple II also had a role in business, as demonstrated by the advent of the first spreadsheet program Visicalc, originally developed for this machine. 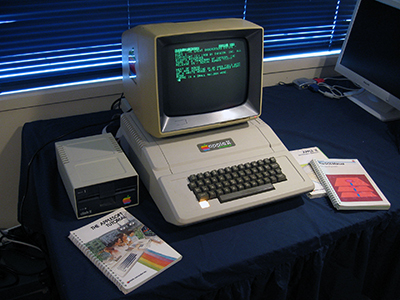 In short, the Apple II epitomised the phrase "Personal Computer". It proved to be one of the most successful and enduring 8-bit line of computers ever. The Apple II+ pictured above (a Europlus variant) was released in 1979. It replaced Steve's Integer BASIC with a Microsoft variety called Applesoft, had the full compliment of RAM at 48k and contained a few other refinements over the original Apple ll. This machine came to me as part of the Apple haul. Like all the donated Apples, it was in a very sorry state and a number of ICs had to be replaced! However, it's now cleaned up and works just fine. I've stocked it up with software using disk images from the Internet. Here it is showing the start-up screen of the Infocom adventure game, ZORK, a popular title on early 8-bit micros. Having spent some time in the innards of the machines I can see why people loved them. Simple and elegant hardware, easy to work on, versatile and extendable. It's a classic member of the pack.